The Trump administration says its zero tolerance policy on illegal immigration is having an impact at the Southwest border, but experts say not so fast. 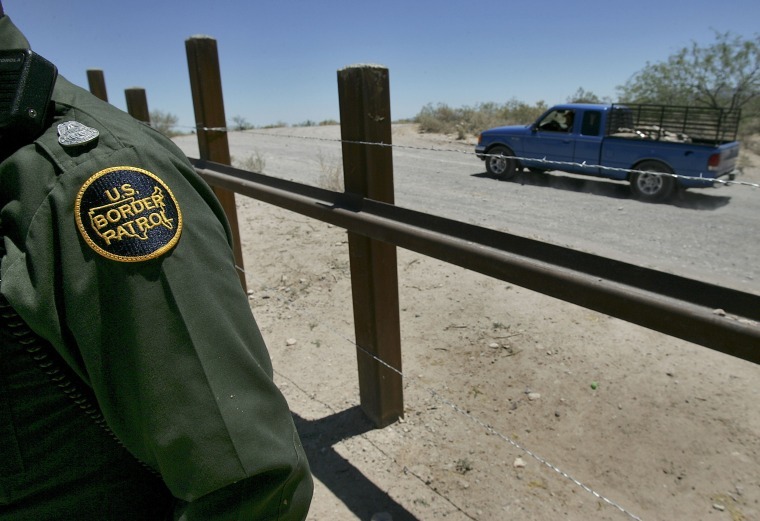 Apprehensions of unauthorized crossers along the Southwest border were down in June, according to U.S. Customs and Border Protection data released Thursday. The fiscal year-to-date total for people allegedly caught crossing without authorization is 286,290, officials said. The Trump administration was quick to argue that its relatively new zero tolerance policy on undocumented immigrants, which included the short-lived practice of separating children from their parents at the border, is dissuading them from coming north. "Following the implementation of the Administration’s zero-tolerance policy, the June 2018 Southwest Border Migration numbers declined by 18 percent when compared to the previous month," Department of Homeland Security Press Secretary Tyler Houlton said in a statement. Not everyone who steps across the U.S.-Mexico boundary without permission is caught, but the apprehension numbers are the best barometer of illegal immigration, experts say. Enrique Morones, founder of the pro-immigrant nonprofit Border Angels, noted that the number of captures along the border has remained historically low in the last five years. "This is not due to Trump," he said via email. "For five years there has been a dramatic decline." And Everard Meade, director of the University of San Diego's Trans-Border Institute, said apprehensions along the Southwest boundary have in fact hovered along a 40-year bottom since 2011. "The long-term pattern is clear — fewer and fewer unauthorized migrants have been trying to enter the U.S. for more than 15 years — and it's mostly the product of larger macro-economic trends, not short-term changes in immigration policy or political rhetoric," he said via email. The latest CBP numbers also seem to question the Trump administration's warnings about a surge in Central American families at the border. "We have people flooding our borders," Trump said at a rally in Montana Thursday night. "Never had a rush like this, people want a piece of our action." In his statement, Homeland Security's Houlton called the situation a "crisis at the border" and he called on Congress to close "legal loopholes that drive illegal immigration." The Trans-Border Institute estimates that apprehensions at the Southwest border are on track to total about 380,000 by the end of the CBP's fiscal year in September. That compares to 303,916 in 2017, 408,870 in 2016, 331,333 in 2015 and 479,371 in 2014, according to CBP data. Lindsay Toczylowski, executive director of the Immigrant Defenders Law Center, said many of the border crossers in May and June have been desperate migrants fleeing violence in Central America. "They're not looking at what the Trump administration is doing in terms of zero tolerance policies when they make that decision to cross the border,” she said. "All they're thinking about is whether or not they can save the lives of themselves and their children." Meade believes the Trump administration is taking credit no matter what direction the border statistics go. "They take credit for historically low apprehensions — nearly the same as they were in 2015 — then they say there’s a terrible spike in arrivals at the border and they need to take crisis measures," he says. "These numbers lay bear the idea that the United States is not overwhelmed by unaccompanied children and family units from Central America right now," he said. "Those numbers in the broader terms of the border are relatively small."